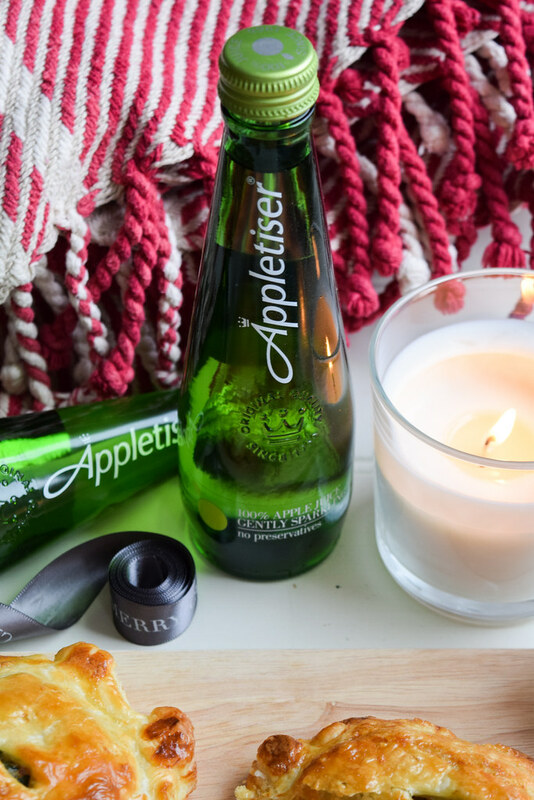 This post was created in partnership with Appletiser. When it comes to Christmas dinner my family are total meat eaters; it would not be Christmas Day without a big turkey stuffed with our family stuffing recipe. However, last Christmas I had loads of requests of a vegetarian Christmas main that could either be served up as the main event or won’t be too much work to serve alongside the turkey. 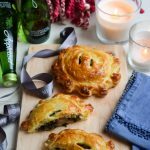 So, this month I thought I’d bring you my recipe for these great Individual Portobello Mushroom Wellingtons; you can make most of them ahead to help reduce Christmas lunch stress, and they can be made vegan by using oil instead of butter and vegan puff pastry. 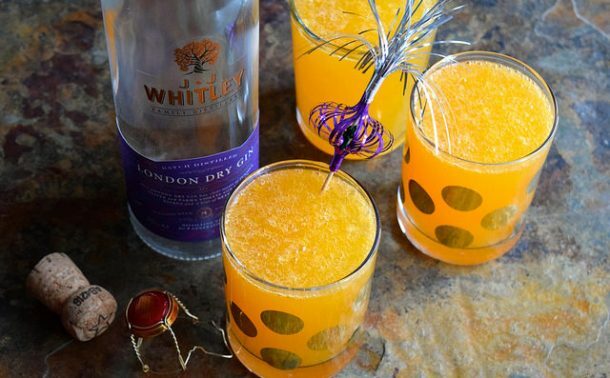 Another festive swap you need to consider when you’re figuring out the menu for the big day is what to serve anyone who is driving or not drinking along with some more boozy options (we tend to have Bucks Fizz, champagne and a bottle of Chateauneuf du Pape on Christmas Day) – last year I teamed up with Appletiser to create a Pomegranate & Rosemary Spritz that would be great booze-free, but again to lower stress on the day, a big bottle of chilled Appletiser would look beautiful on the Christmas table (green is basically the ultimate Christmas colour!) 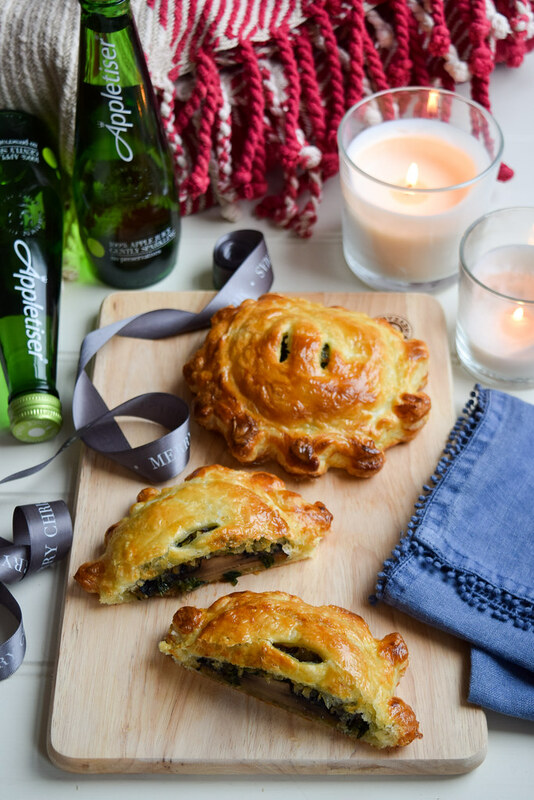 Appletiser’s gently sparkling apple juice (with no added sugar) is the perfect pairing for these wellingtons as the apple really helps bring out the sweetness in the caramelised onion layer. 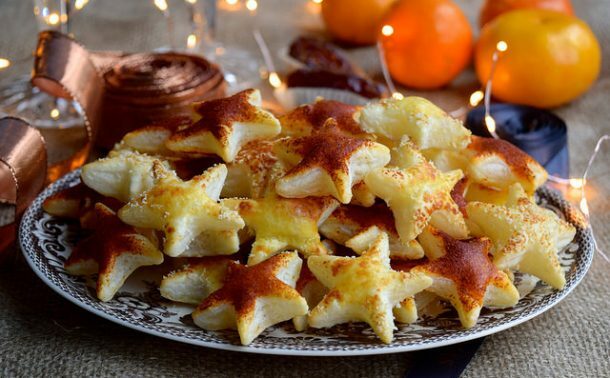 Regardless if you use a block of puff pastry or a pre-rolled sheet save any leftover scraps and egg wash to make some of my Paprika & Parmesan Cocktail Stars. Later in the month I’ve got a recipe for Ginger & Parmesan Cheese Straws which will also be great for using up the leftovers in this recipe. Keep an eye out! 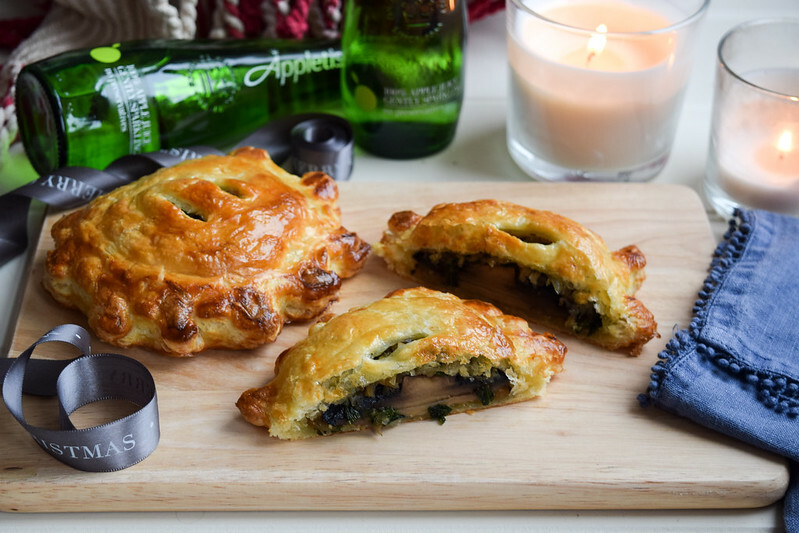 The filling for these easy Individual Portobello Mushroom Wellingtons can be made ahead for a stress free vegetarian Christmas main. This recipe can also be made vegan by switching out the butter for oil and by using vegan puff pastry. Pre-heat the oven to 200 degrees. Place the mushrooms smooth side down in a shallow baking dish, season generously with salt and pepper and drizzle with extra virgin olive oil. Once the oven is up to temperature, roast the mushrooms for 20 minutes. Turn them upside down over a few pieces of kitchen towel to remove any excess moisture while they cool completely. 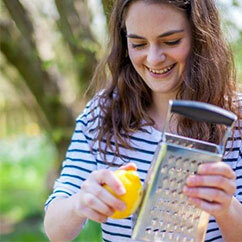 Meanwhile, heat a knob of butter and a splash more oil in a large frying pan over a medium heat. Add the onions, season, and cook for about 25 minutes until they have started to caramelise. Add the garlic and kale, and cook until the kale has softened. Set aside to cool. 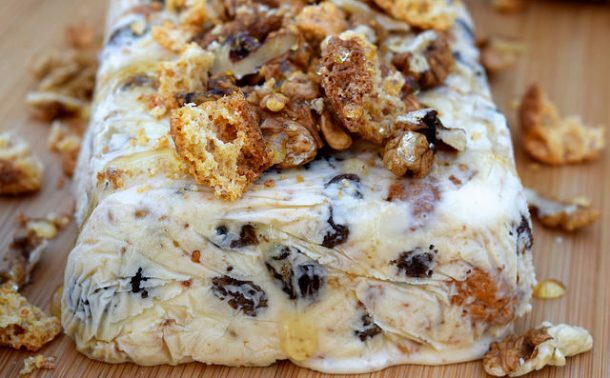 Once the mushrooms and the onion mixture have cooled completely, line a baking tray with baking parchment. Lightly flour your work surface and unroll the puff pastry, dividing it into four squares. Pile a quarter of the onion mixture into the middle of two of the squares leaving a generous boarder, and place each mushroom, smooth side down on top of each pile of mixture. Divide the rest of the onion mixture between the tops of each mushroom, and shape into a dome with a metal spoon. 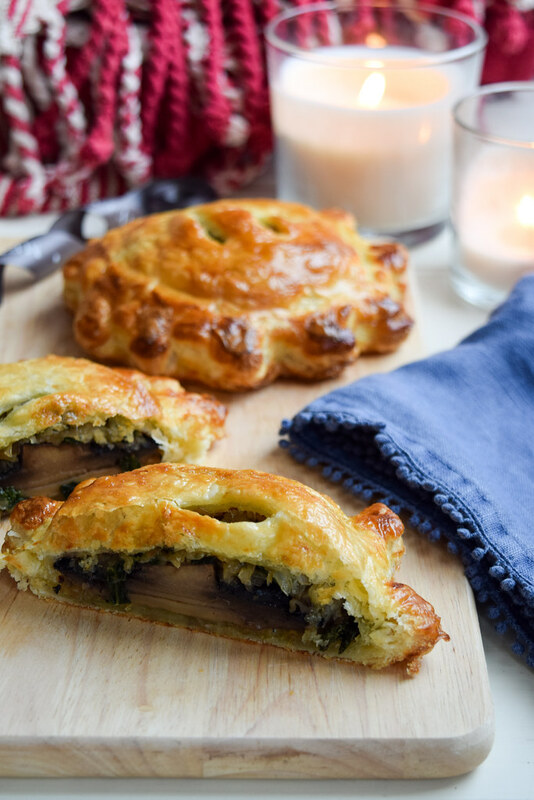 Brush the space around the mushrooms with beaten egg and lay the other two pieces of puff pastry on top. Press down the edges to seal each wellington, and trim the edges to make circles with about a centimetre and a half of extra trim. Seal the edges of the pastry either with a free form scallop (I demonstrate how to do this here) or by just rolling over the edges. 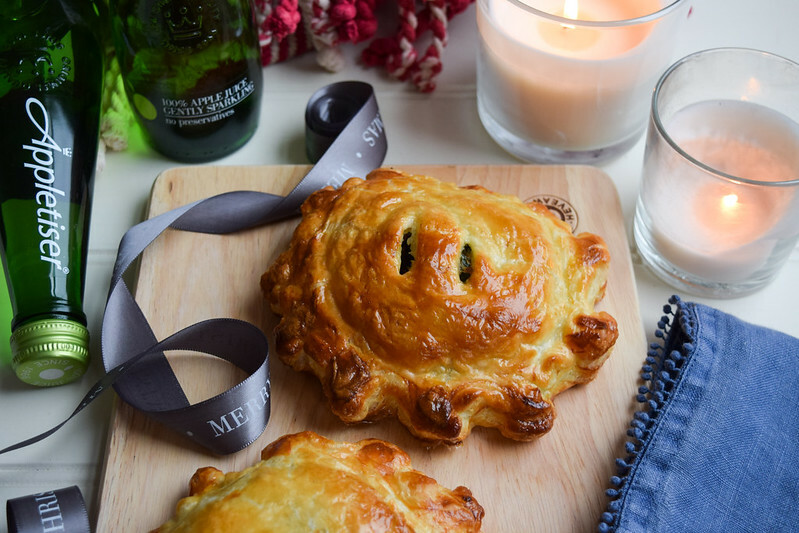 Create two slits in the top of each wellington with a sharp knife to allow any excess steam to escape (we don’t want any soggy bottoms!) and brush each one with more beaten egg. Bake in the oven for 20 minutes until golden. To give this recipe an extra festive boost, I switch the extra virgin olive oil out with truffle oil and the sea salt for truffle salt.